One of the disadvantages of being self-employed is you don’t get to go to work parties; or maybe that is a benefit? Feeling slightly sorry for myself, I invited Joe Breen, a friend and my predecessor in the Irish Times wine column, around for our own staff party – lunch in my house. As we were eating a small roast of lamb followed by some cheese, I decided to open two Cabernets. Both were magnificent, and we spent a very happy afternoon righting the wrongs of the world over two delicious and very different wines. Ch. Léoville-Barton has always been one of my favourite wines of Bordeaux. The Barton family have remained true to the traditional more elegant style of claret, resisting the temptation to bump up the ripeness, alcohol and new oak to please some sectors of the market. They have also been restrained in their pricing; both Langoa and Léoville-Barton remain relative bargains when compared to their peers. The result is beautifully made restrained wines at affordable prices. 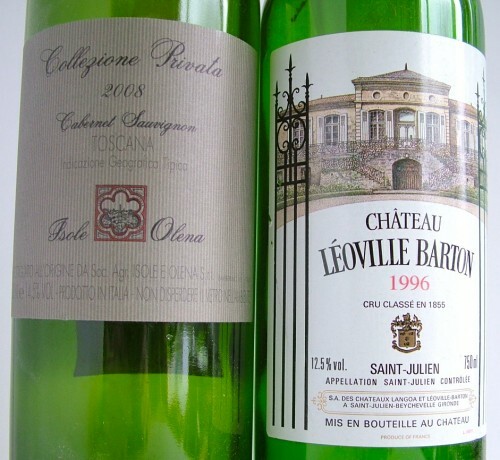 I have tasted the 1996 Léoville a number of times with mixed results. A few bottles have been distinctly barnyardy, but others were much better. This was one of the best bottles. Fully mature, with a wonderful fragrance and elegant blackcurrant, mint and cigar box. Classic St. Julien. Good length and still very much all there. It did not fade at all over three hours. A real treat. Isole e Olena is one of the greatest producers of Chianti Classico. Paulo di Marche also makes a few excellent varietal wines, including this Cabernet. It was an excellent wine, certainly superior to most of the rival Cabernet-based ‘super-Tuscans’ that I have tasted over the years. A puppy when tasted alongside the Léoville-Barton, but this is a magnificent wine. Tight and tannic with masses of firm ripe dark berry fruits (and a healthy 14.5% alcohol) this needed the lamb to provide a foil for the tannins. It opened out beautifully over the course of a few hours.